For those of you who have been following my blog for the past year, you know my life has been touched by VACC Camp, a unique camp hosted by Miami Children's Hospital every Spring for ventilation assisted children (children needing a tracheostomy ventilator, C-PAP, BiPAP, or oxygen to support breathing) and their families. Last year, I was commissioned by the hospital to document the 25th Anniversary year of the camp. I spent the entire week getting to know not only the wonderful campers and their families but the people who work the whole year round to make the camp a reality and the many young volunteers who give up their Spring Break to care for these challenged children. It's a life-altering experience for all involved. I wrote about my experience at the camp and produced a short video from all my footage that helped earn the program $25,000 from the Mercedes Benz "Community Stars" program. Over the past year, I have continued shooting post-camp interviews with several of the families and hope to have a full-length documentary film on the camp completed by this summer. 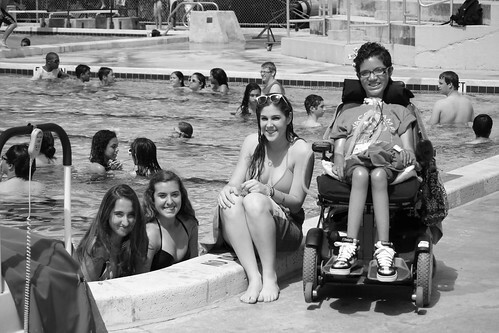 This past week, however, I stopped by the camp to spend an afternoon with the campers and volunteers on "Pool Day", the day where the campers, many of whom are connected to ventilators 24 hours a day, get to go "swimming" in the large pool at A.D. Barnes Park in Miami. It's one of the highlights of the camp. Classic Movie Poster REDUX: Stanley Kubrick's "The Shining" Video of the Week: "Barbershop"